Creating a 21st century learning environment can be challenging. We want students to go beyond simply memorizing information, instead absorbing the information so they can build on it throughout the school year and beyond. But how do you create a learning environment to engage students? Here are five ways Interior Concepts can help design furniture to complement your collaborative classroom and learning approach. A classroom should be a team environment where students are working together to master the concepts. Heavy desks and tiny classrooms can make group work difficult. This is where Motion multi-purpose school tables come into play. These tables are designed to be moved around frequently, so they hold up to high use environments and frequent classroom changes. They can be easily arranged into variety of classroom layouts so you can spend less time moving desks and more time on group projects that will foster learning. There is no doubt that hands-on learning is the most effective teaching method. Everyone learns better when they can use their senses to explore the concepts being taught. Motion unique table shapes can help with this. You can push the tables together in creative layouts like pinwheels and sprockets for large groups and then pull them apart for individual or small group work. Horizontal white boards allow students to have their own writing space in which to think and create. Brainstorming becomes much easier when a child has the ability to draw and write his or her ideas without the limits of a small sheet of notebook paper. Students can also use the white boards to collaborate with each other, then transfer the results to the finished project. You can incorporate horizontal white boards into any Motion school table, turning the entire space into an area for brainstorming and working. 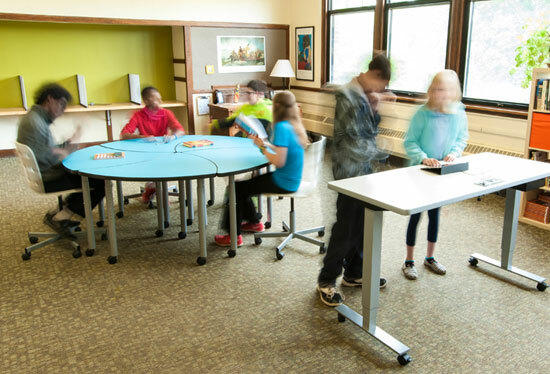 Influence adjustable height tables from Interior Concepts are designed to provide the utmost flexibility in the classroom. There are many different choices from lightweight counterbalance adjustable tables to heavy duty crank adjustment tables. A more manual pin-clip adjustment is also available with Motion student tables. Your students can go from sitting activities to standing activities in just a few minutes. For younger children, you may choose to set the tables up as centers. This way, you can adjust the height of the tables for your students. You might even choose to have an adjustable table for your own desk so that you can work at a comfortable height for each of your daily tasks. Unique shape office school tables with white boards are not the only design innovation Interior Concepts has for your classroom. The DropShare Media Center allows up to six users to connect using VGA or HDMI connections. With the DropShare Media Center, students can collaborate on a learning project or staff can collaborate on an administration project by easily sharing information from each individual’s device onto a larger screen. We will design the media center around your furniture, so you are not limited to just one table style. With so many options available, you can easily transform your classroom into a 21st century learning environment. With the right design, your classroom furniture design can help you implement dynamic lesson plans that foster a love for learning in your students. Interior Concepts wants to help you create a collaborative learning environment for students. Give us a call today, 800-678-5550.